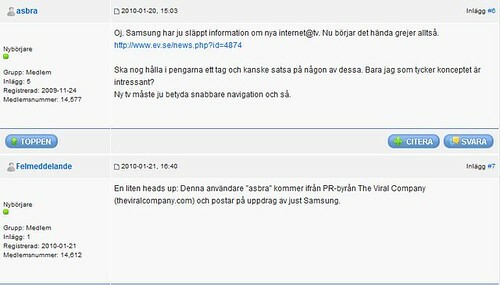 I blogged the other day about how a “viral agency” had been posting nice reviews in Swedish online forums on behalf of Samsung, but without disclosing their true identity. The scam was revealed and in a comment to the marketing blog Adland, Samsung said that the procedure was out of line and that they had put an end to it. However, it seems that this undercover operation to get a buzz going may not be limited to Sweden. In an article today on the UK computer forum Computeractive.co.uk, Deputy Editor Tom Royal, writes that someone has started threads on the forum, promoting Samsung products such as digital video cameras. 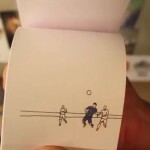 Other places with the same text and video are here, here and here. I realize that it is possible that Samsung has nothing to do with the spreading of this video, it may just be enthusiastic fans or spam sites that scrape content online. But it is starting to look a bit suspiciuos don’t you think? Tom Royal has tried to get a comment from Samsung and promised to post if he gets a response. We will continue to follow this story as it unveils. Footnote: Original story found here, in Swedish. Volkswagen turns to social media when promoting new cars. In a recent Advertising Age article, Volkswagen of America says it is launching the next generation GTI exclusively on an iPhone app, because it is a cost-efficient marketing tool. Compare that with the $60 million Volkswagen spent on TV commercials on the 2006 launch of GTI. And in Sweden, Volkswagen has produced three videos that have gone viral, to the extent that one of them has become the most viral video ever made (even more viral than Susan Boyle, thank God), at least according to the Viral Video Chart. “Pianotrappan” (the piano stairs) has been viewed almost 7 million times in less than a month, but what makes it the most viral video is the number of blog posts and tweets about the video (3,100 blog posts and 12,800 tweets). Well done Volkswagen and DDB. See also the other two videos here and here. Tags: viral, video, volkswagen, volkswagen, video, utpressning. Ping.